Ulama of the Hanafi madhhab (school of thought), like those of the other madhahib, emphasised the role and importance of the Khilafah throughout the ages. 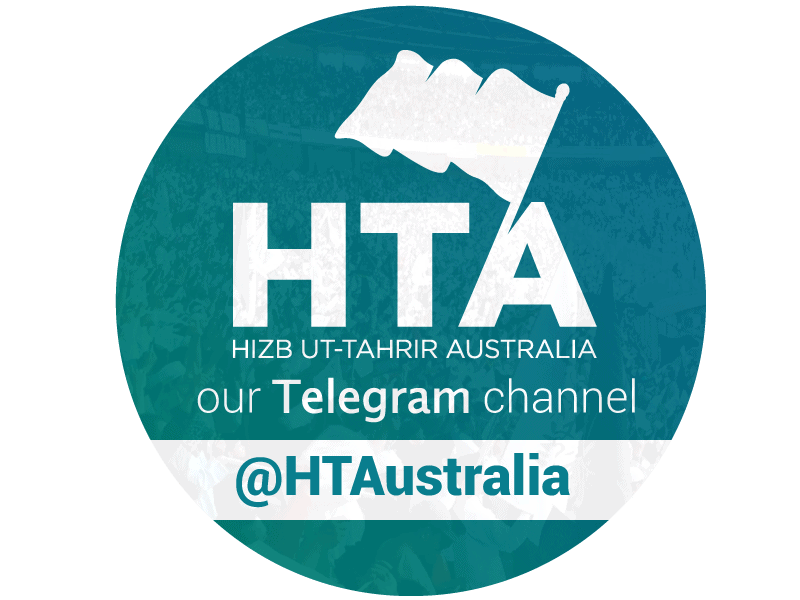 In many respects, they had more to say about issues of ruling and governance than other ulama since many khulafa – the Abbasids and Ottomans in particular – adopted the Hanafi madhhab and sought advice and rulings from the Hanafi ulama of their times. In this article we look the views of the Hanafi scholars in this regard, as gleaned from their writings. For example, the Abbasid Caliph Harun al-Rashid wrote to Imam Abu Yusuf (rh), the student and companion of Imam Abu Hanifah (rh), asking him questions about how to manage the finances of the state. 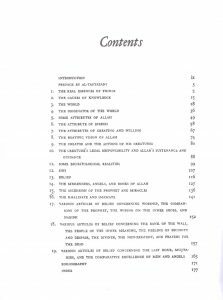 Imam Abu Yusuf wrote back with his famous and excellent treatise entitled Kitab al-Kharaj, detailing many of the Shari’ah rules regarding state finances. He emphasises here how important the Khilafah is in Islam, showing that so many of the fundamental Islamic obligations depend on it and cannot be fulfilled properly without it. An urdu translation of the famous ‘Aqaid Al Nasafiyyah. Imam al-Taftazani (rh) mentions a number of important points here. First, he notes that there is ijma’ of the ulama that the Khilafah is an obligation on the Ummah. As for the difference he alludes to, he is referring to the disagreement of the Shi’a, who held that it was obligatory but on Allah (based on their belief that Allah appoints the imams) and the Mu’tazila, who held that it was an obligation based on the mind (based on their usul in which the mind can establish certain obligations). However, he notes the correct position held by all the scholars of the four madhhabs that it is an obligation on man based on the text. 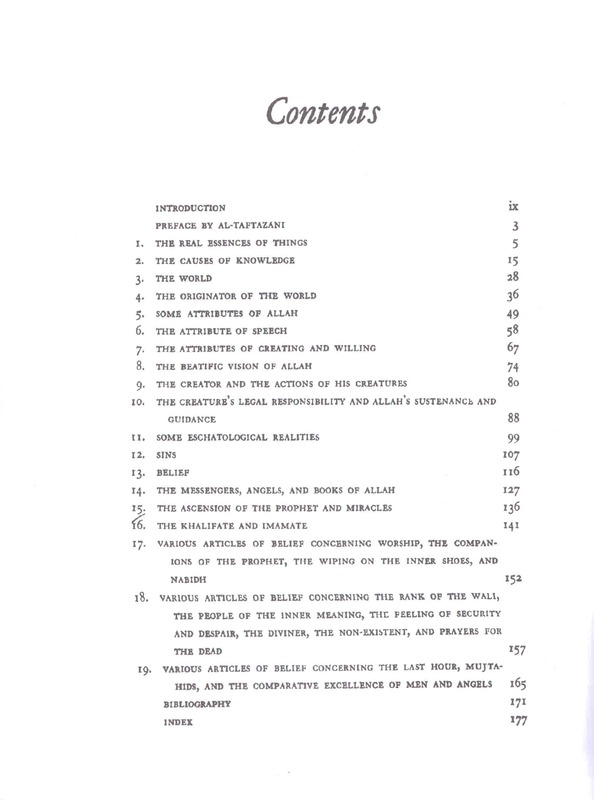 Contents of the only English translation of Imam Taftazani’s Sharh of Imam Nasafi’s book on ‘Aqidah. Dying a death of jahilliyah here denotes prohibition, as noted by Ibn Hajr in Fath al-Bari. Third, he mentions the well-known fact that the noble Sahaba considered the Khilafah of such utmost importance that they delayed the burial of the noble Prophet (ﷺ ) for it, giving it priority. Fourth, he explains its importance above other obligations in that it is not just an obligation but one on which other obligations (such as the ones mentioned by Nasafi (rh)) depend, therefore of the highest priority. It is also relevant to note here that all this discussion about the Khilafah is taking place in a book on aqidah, even though the Khilafah is a matter of fiqh, not belief per se. This is because the Khilafah was a matter on which certain Islamic schools with wrong beliefs, like the Shia, Khawarij and Mu’tazila, held wrong positions. Therefore the matter entered debates that had their origin in creedal matters, and since it was a matter of great importance in Islam, scholars discussed it in books of aqidah. while in the hadith of the Khalifah being a shield, also in Muslim, he (ﷺ) said: “Indeed, the Imam is a shield…”. 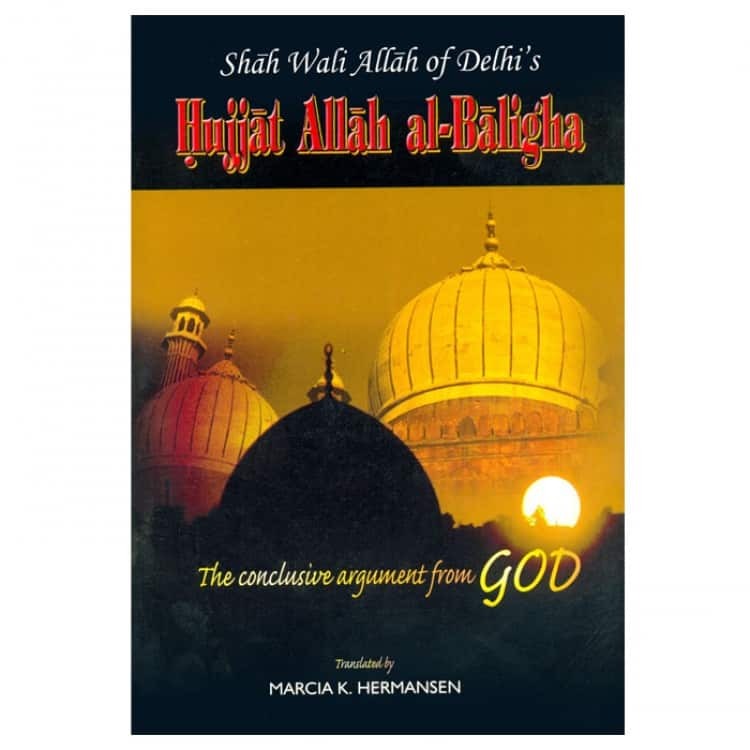 A well known English translation of Shah Waliullah’s famous book. Of course, the issue is also mentioned in many books of Hanafi fiqh. 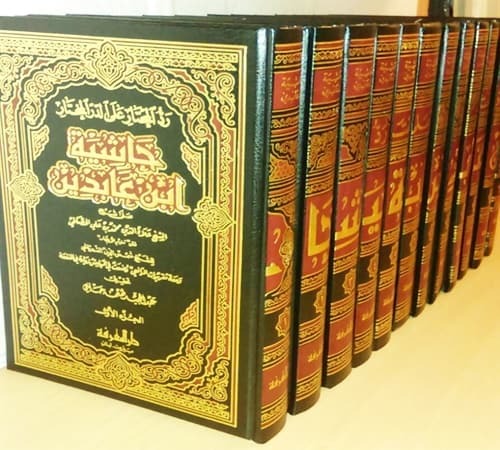 One of these is the magnum opus of the great Shami scholar of the 12 century Hijri, Muhammad Amin Ibn Abidin (d. 1252 AH) of Damascus, who is perhaps the most renowned of the latter Hanafi fuqaha, particularly in the Subcontinent. He is known as the final verifier (khatimat al-muhaqqiqin) of the Hanafi madhhab. His work, Radd al-Muhtar [Reply to the Perplexed], also known as Hashiyat Ibn Abidin, is taken as the final word on most issues in Hanafi madhhab. The monumental Hashiyah Ibn ‘Abidin. It is an elaborate commentary on the excellent treatise of the erudite Hanafi faqih of the 11 century hijri, Ala’-Din al-Haskafi (d. 1088 AH), Durr al-Mukhtar [The Choice Pearl], which itself is a commentary on the work of al-Turtumashi of Gaza (d. 1004 AH), Tanwir al-Absar [Illumination of the Eyes]. “The major imamah (khilafah) is the right of general disposal over the people. 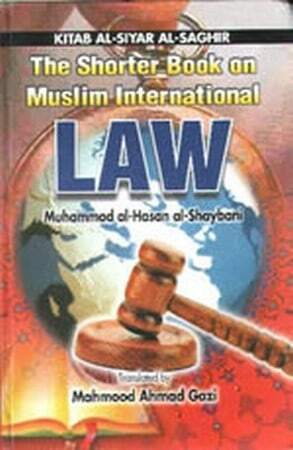 Its study is in ‘ilm al-kalam and establishing it is the most important of obligations [it is of the most important obligations because the fulfillment of so many other shari’a obligations depends on it]. For this reason did they (the sahaba) give it priority over the burial of the Prophet (saw) [He (saw) passed away on Monday and was buried on the day of Tuesday or the night of Wednesday or its day (according to the different narrations), and this sunnah remains till this day such that the khalifah is not buried until another is appointed].” Radd al-Muhtar ‘ala al-Durr al-Mukhtar, 1: 548. Al-Haskafi thus defines the Khilafah as the right of general disposal over the people. By this he means it is the right to manage the affairs of the people and is an absolutely general right, that is, it encompasses all the people in the lands of the Khilafah in all their public affairs. This is as opposed to the particular right of governors and judges, whose right of authority is in over some people in some areas to the exclusion of others. This latter part of the definition indicates that the Khilafah is a position in succession of the Prophet (ﷺ). This means that the role of the Khilafah is to succeed the Prophet (ﷺ) in implementing the Shari’ah. This is why he is called a Khalifah, which linguistically means successor. Al-Haskafi then goes on the mention the conditions of the Khalifah, noting those which are agreed upon such as his being Muslim, free, male, sane, baligh (mature), and able and some which are differed upon such as his being from Quraysh, a mujtahid and brave. He also negates some of the conditions claimed by other sects like that he be Hashimi, Alawi or infallible. 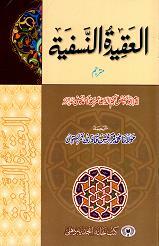 More generally with reference to the fiqh of matters of ruling and governance, many Hanafi works have been written dealing with the subject matter from various angles, starting with the Kitab al-Kharaj of Abu Yusuf (d. 162) and al-Siyar al-Saghir and al-Siyar al-Kabeer of Imam Muhammad ibn al-Hasan al-Shaybani (d. 189), the two students of Abu Hanifa. Imam al-Sarkhasi (d. 483 AH) then wrote a commentary of al-Siyar al-Kabeer. Many later works were also written. All of this shows the absolute importance attached to the Khilafah by the ulama of the Hanafi madhhab. This should serve as motivation for today’s ulama and students of shar’i knowledge to pay due attention to this matter and indeed to be at the forefront of working for the re-establishment of the Khilafah. This article was initially written for publication in the Nusrah magazine issued by Hizb ut-Tahrir in Pakistan.